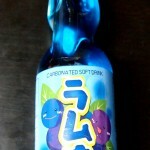 Review: “Ramune Blueberry Flavour” | Oyatsu Break! As I mentioned in my Banana Kit Kat Bar review, one of my favourite artificial flavours is fake banana, and sure, that’s weird, but you probably have a favourite artificial flavour too, if you think about it. Well my top favourite artificial flavour? Blueberry. I love that stuff. Thinking back I probably love it as much as I do because it was so rare growing up. Boo Berry made verrrrry infrequent appearances in our cereal aisle, and yet was constantly available on the American television commercials beamed into our TV Sets Saturday morning. Blueberry gum, blueberry candy, it’d get a big introduction and then fade from the stores almost immediately. And the worst part? Real blueberries tasted NOTHING like artificial blueberry. How disheartening! Blueberry yogurt was passable, but if you wanted that insanely sweet hit of Boo Berry Blueberry goodness, your fixes were few and far between. And so when Asian Food Grocer had a blueberry Ramune drink available for purchase? That got dropped right into my shopping cart. Packaging: I probably should have reconsidered buying this at all. The packaging is a little terrifying. 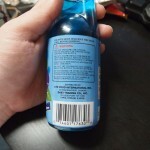 The bottle is under-designed, a Japanese-manufactured bottle with an English-language label poorly applied. There are no brand names on this bottle, anywhere. No copyright information. Literally no one to take responsibility for this drink should it kill me–just a variety of distributor names that may or may not be the same organization. 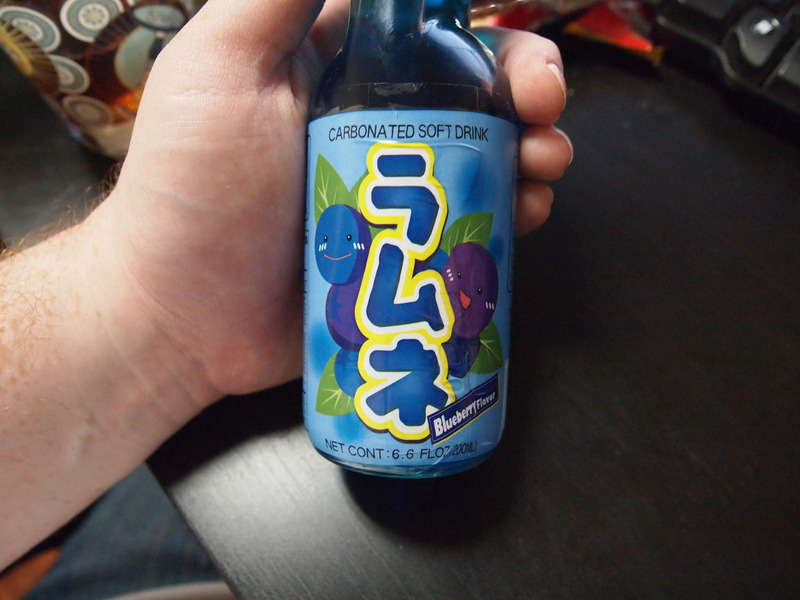 The only reason I might normally go ahead and try it is the charming Engrish on the bottle—“FOR EVEN MORE DELICIOUS THIS DRINK CHILL BEFORE DRINKING”—and the fact that it’s blueberry, and I will try artificial blueberry anything. Oh, also? Bright blue. 2000 Flushes blue. Normally not a problem for me, but in this instance it did give me pause. 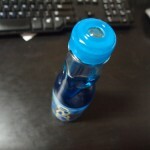 I will say that the classic Ramune bottle is intact, complete with marble, narrow neck, and plastic mouth piece. Also bright blue. Smell: Popping the marble out, it doesn’t really smell anything like blueberries—real or artificial. 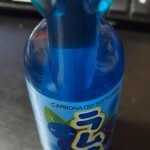 It does smell a lot like standard ramune pop though. 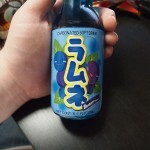 Taste: It tastes like slightly syrupier, slightly flatter ramune. I can’t get detect anything blueberry flavour in this thing. Verdict: Horribly disappointed. If you ever see some random soda-pop on the shelf with no copyright information, no brand name, and it looks like 2000 flushes? Well don’t you buy that product, mister, even if it has chibi blueberries on it. Especially if it has chibi blueberries on it. I think the color alone would have been enough to deter me! You are a brave, brave man to have given this a shot. Hah, thank you. 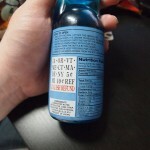 I actually love to drink things that are blue… as long as I can find that company if I need to if/when something goes wrong.